there is a new GoPro camera model coming out that promises to be easier to use, twice as sharp and will offer streaming video over Wifi ! There’s a new way to GoPro and it’s called the HD Hero2. It updates the original HD Hero with features like faster image processing, a lens that’s “twice as sharp,” 11 megapixel photos and better low-light imaging. More importantly, and much more in demand, are a better on-camera user interface and a slate of wifi remote products to be released in the winter, including a wifi BacPac, that will allow you to control the Hero2 with your phone, tablet or computer and instantly stream footage. You’ll find it at GoPro.com and Best Buy for $299.99, and you’ll find a press release with all of the new features after the jump. Oh, and for what it’s worth, the original GoPro Hero has dropped in price to as low as $199.99 for those looking to save a Benjamin. HALF MOON BAY, CA (October 24, 2011) – GoPro today announced the release of its new HD HERO2® camera. Twice as powerful as GoPro’s original HD HERO camera, the HD HERO2 enables consumers and professionals to capture and broadcast their lives most exciting moments in professional quality 1080p HD video and 11 megapixel photos. 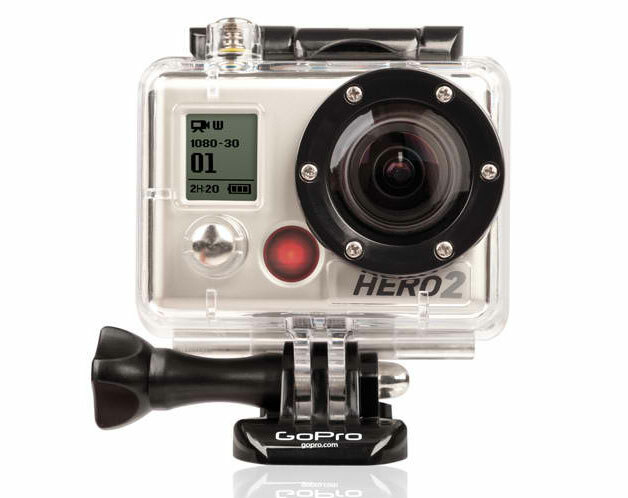 The new HD HERO2 is now available at GoPro.com, specialty retailers around the world, and at Best Buy for MSRP $299.99. Arguably the most versatile camera in the world thanks to its innovative mounting system, renowned durability and small form factor, the HD HERO2 surpasses its predecessor with several technology upgrades. The HD HERO2’s new processor delivers twice the processing power, taking full advantage of a new high performance 11 megapixel sensor that delivers more than twice the image detail along with professional low light performance. A totally redesigned wide-angle lens was required to take full advantage of the HD HERO2’s increased image processing, resulting in a lens thatʼs twice as sharp as the previous model. And with the arrival of GoPro’s new Wi-Fi BacPac™ and Wi-Fi Remote products slated for release this winter, the HD HERO2 will enable video remote control via the Wi-Fi Remote, smartphones and devices, tablets and computers as well as enabling live GoPro video broadcast from anywhere there is Wi-Fi or a mobile hotspot. Visit http://gopro.com/hd-hero2-cameras/ for more information on the HD HERO2, Wi-Fi BacPac and Wi-Fi Remote products. “The HD HERO2 is much, much easier to use than the original HD HERO. If you know how to use a traditional camera, you can use the HD HERO2 straight out of the box without instructions. This makes the HD HERO2 very powerful as an every day, easy to use consumer camera while retaining all of the features, modes and performance that has made GoPro the best selling small form factor HD camera to Hollywood,” said GoProʼs Director of Product Definition, Rudy Samuels. The original 1080p HD HERO camera is now available for MSRP $199.99 – $239.99 (USD) (previously $259.99 – $299.99) through GoPro.com and GoProʼs worldwide authorized dealer network. The Wi-Fi BacPac and Wi-Fi Remote are also compatible with the original HD HERO camera, but functionality is limited to remote control only. Video and photo streaming is not supported.